This product was added to our database on Friday 19 January 2007. Included in this kit is the ETC rack, anti-sway brace legs and fuel connectors. 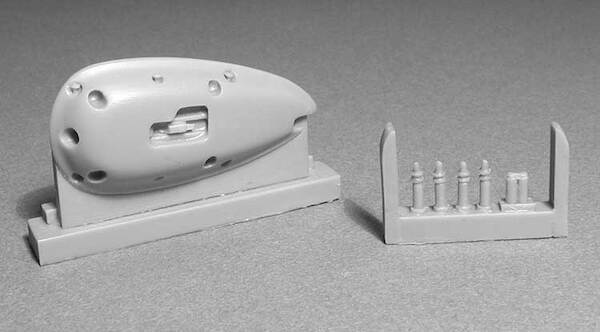 It is designed to enhance any 1/48 scale Bf 109 F, G or K series aircraft, and in particular, the Hasegawa kit series. Actual ETC racks designed to fit Bf 109s had different manufacturers, and there were some variations in the shapes and subtle details. This set represents a "tear drop" shaped rack, with typical fittings, including mounting rack details, external release catches and fuel fittings.